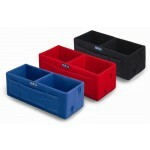 The dual helmet box has two compartments to accommodate two helmets. 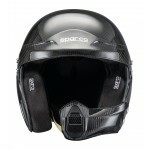 Sparco AIR PRO RJ-5i Helmet The AIR PRO RJ-5i Helmet has a carbon fibre shell reinforced with carbon-Kevlar. 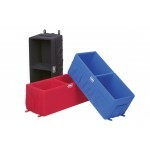 The shell and EPS are manufactured in two sizes and has been designed to ensure excellent ventilation. The interior linings can be removed, washed and repositioned. 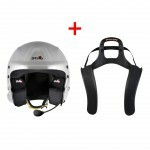 It comes with professional communications system (adjustable carbon fibre boom, noise cancelling microphone and high quality speaker) and military grade connections (Nexus connector). It comes with colour coded carbon fibre peak and Hans clips fitted. Available in 7 sizes and 2 colours. 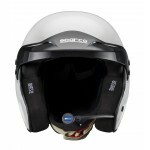 Sparco SKY RJ-7i Carbon Helmet The SKY RJ 7i helmet has a carbon fibre steel reinforced with carbon-Kevlar. 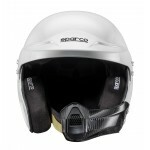 The shell and EPS are manufactured in two sizes and has been designed to ensure excellent ventilation. The interior linings can be removed, washed and repositioned. It comes supplied with a professional communications system (adjustable carbon fibre boom, noise cancelling microphone and high quality speaker). and military grade connections (Nexus connector). It comes supplied with a carbon fibre peak and Hans clips fitted. Available in 6 sizes. 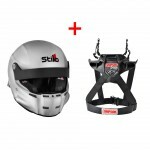 Stilo WRC DES Composite Helmet + Simpson Hybrid Sport Device Stilo WRC DES Composite Helmet Fiberglass - Kevlar MSF (Multi sandwich fiber) helmet. Microphone boom and plug integrated. Adjustments: microphone position, peak, earmuff pressure. Optional set up: adjustable short visor. Snell and FIA approved 8859-2015. Sizes available: XS, S, M, L, XL Simpson Hybrid Sport Device SFI 38.1 certified, FIA certification available. The Hybrid Sport from Simpson features a light-weight design using DuPont® carbon/polymer construction and provides maximum comfort and maneuverability with superior strength. Hybrids come race ready. The trusted low profile design disappears into the seat when worn and allows for easy in and out of the race car, eliminating the danger of becoming caught in other gear. The protection stays with the racer during multiple impact, flips and rolls. Available with patent pending multi-tether system to enhance side to side movement. DuPont carbon polymer construction. 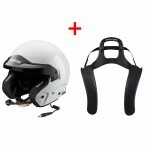 Sleek, modern profile with defined wings for seatbelt containment. Sizes available: XS, S, M, L, XL Please note sizes L and XL are an additional £25 + vat. 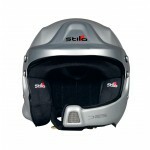 Stilo ST5R Composite Rally Helmet + Simpson Hybrid Sport Device Stilo ST5R Composite Rally Helmet Fiberglass - Kevlar MSF (Multi sandwich fiber) helmet. Much lighter, smallest shell with increased vision. 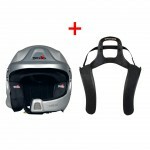 More comfortable and more aerodynamic with better driver ventilation. Multi function visor locking clasp. Integrated plugs. Prepared for frontal drinking system. Adjustments: microphone mouth distance, ear area customisation. Snell SA2015 and FIA approved 8859-2015 Sizes available: XS, S, M, L, XL Simpson Hybrid Sport Device SFI 38.1 certified, FIA certification available. The Hybrid Sport from Simpson features a light-weight design using DuPont® carbon/polymer construction and provides maximum comfort and maneuverability with superior strength. Hybrids come race ready. The trusted low profile design disappears into the seat when worn and allows for easy in and out of the race car, eliminating the danger of becoming caught in other gear. The protection stays with the racer during multiple impact, flips and rolls. Available with patent pending multi-tether system to enhance side to side movement. DuPont carbon polymer construction. 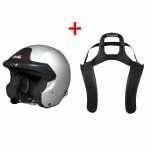 Sleek, modern profile with defined wings for seatbelt containment. Sizes available: XS, S, M, L, XL Please note sizes L and XL are an additional £52 + vat. 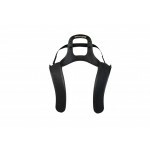 Stand 21 Club Series III HANS device. Available for the following angles/sizes: 20°M and 20°L FIA 8858-2010 certified Supplied with sliding tethers allowing greater head motion. 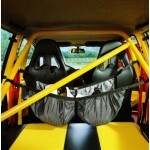 TRS Helmet Hammock For protection of helmets between stages. 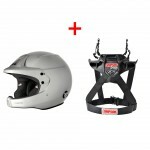 Attaches to roll bar and holds two helmets. New mesh centre is tangle free and ideal for Peltor intercoms. 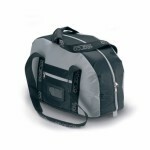 Professional helmet bag, with lots of pockets for visors, spares and accessories.